SPAN with ALIGN - What is it good for? First added as a feature to the SPAN-CPT in 2010, NovAtel’s dual antenna heading solution, ALIGN, has proven to be valuable in improving the heading solution of the SPAN GNSS (Global Navigation Satellite Systems) + INS (Inertial Navigation Systems) product line. GNSS and INS are complementary technologies. While GNSS is absolute (and noisy), INS is relative and smooth. Any independent source of information, such as adding ALIGN to your SPAN solution, provides one more way to help improve your solution. What is GNSS + INS? GNSS systems (GPS and GLONASS) are constellations of satellites that orbit Earth, constantly providing signals with their location and time. Using these signals and solving for time, a receiver is able to determine the user’s precise latitude, longitude and altitude. GNSS computed positions are typically very accurate and available. However, there are locations where GNSS does not work well, or at all, such as in ‘urban canyons’ or in tunnels where there is no direct line of sight to GNSS satellites. The combination of GNSS and INS addresses this challenge with some additional benefits. An INS is made up of an IMU (Inertial Measurement Unit) and a navigation processor. The IMU includes three gyroscopes (which measure changes in angle) and three accelerometers (which measure changes in velocity). Each gyroscope is fixed at a 90 degree angle to the other two, forming a coordinate frame. The same applies to the accelerometers. By summing the changes in velocity, combined with the direction (attitude), the INS determines its velocity and direction. Summing the velocity leads to position. In this way, the INS determines the change in position, velocity and attitude. Because the changes measured by the INS are relative, a starting point, called the initial alignment, is needed. GNSS can easily provide the starting position and velocity, and the INS can detect the roll and pitch from the ‘strong’ signal of gravity. The most difficult component is heading. ALIGN is NovAtel’s dual antenna, precise positioning and heading technology. Combining two receivers, an ALIGN enabled system can generate the heading angle between two antennas to an accuracy of 0.20 degrees when the antennas are separated by one metre. This heading is computed relative to true North and is available on an ALIGN enabled SPAN system. How does ALIGN help improve the inertial solution? The process to determine heading for an INS is difficult. In high grade systems, the gyroscopes are sensitive enough to detect the spin of the Earth1, allowing the system to determine true North. From the initial alignment, changes in heading are continually added to the solution to get the current heading. In systems that are less sensitive, an external source is required to provide the initial alignment. In a SPAN system, if the IMU cannot detect Earth’s rotation, initial alignment can be done through user input (SETINITATTITUDE command), kinematic alignment (requiring motion), or an ALIGN solution. If the lever arm (distance from the IMU to the antenna) is known to both antennas of an ALIGN enabled receiver, the difference of the ALIGN heading, compared to the heading axis of the INS, can be computed. This information allows the transfer of the dual antenna heading to the INS, providing an initial alignment for the attitude solution. 1If the gyroscope has a drift and noise total that is significantly less than 15 degrees/hour, the rotation of the Earth can be detected, and heading determined autonomously. The most difficult attitude component to determine in a GNSS + INS solution is heading (azimuth) because the rotation of the Earth is small compared to the noise and errors in gyroscope measurements. Roll and pitch can be determined with greater ease, as they depend on the very strong ‘signal’ of gravity. Adding an ALIGN solution improves the ongoing performance of the SPAN system by providing constant information about heading from an outside source. I heard SPAN with ALIGN is better now. How did that happen? To improve the heading accuracy, SPAN uses the complementary attributes of ALIGN. Independent of the heading determined by the INS, the heading solution provided by ALIGN can help to continuously estimate the errors in the inertial measurements and refine the solution. 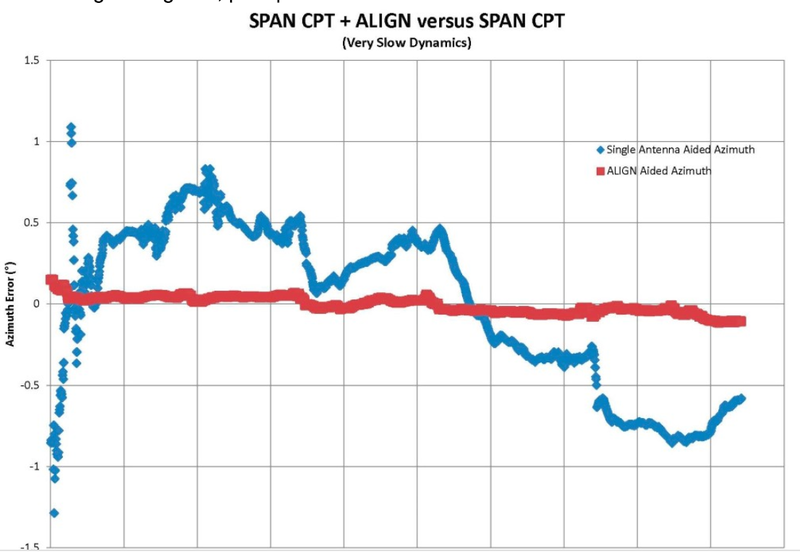 In the latest release of SPAN firmware, the difference between the ALIGN heading vector and the SPAN heading is now constantly estimated and refined, allowing the system to make better use of the heading update. Also, the ALIGN solution is now used when the system is in a turn, increasing the availability and usefulness of the external heading update. As with all systems that involve multiple inputs, the system is greater than the sum of the parts. The ALIGN solution is only one component of the SPAN heading. While the ALIGN solution is very accurate (improving with increased antenna separation), the additional need to mathematically transform the ALIGN solution into the INS computational frame, along with the GNSS measurement noise in the ALIGN solution, requires careful weighting of the additional information in the SPAN solution. Absolutely! The more information from independent sources that is input into the SPAN filter, the more the solution will improve. The ALIGN solution is only used when there is confidence that the solution is good and a number of checks have passed2. It is important to remember that the ALIGN heading does not replace the INS heading, but augments it. To get the best possible results, move the system through some dynamics (turns, accelerations, and decelerations) to help the system determine error and help improve the result. More turning also helps the system ‘see’ the error in the offset from the ALIGN solution to the INS heading, allowing the system to make better use of the ALIGN heading information. Low dynamic situations (slow velocities, few turns) are a challenge for inertial navigation systems. This is especially true for lower cost systems. Lower dynamics reduce the ability of the navigation filter to estimate the errors in the system because there are fewer independent observations. Adding ALIGN to your system provides an additional, independent observation source of the most difficult to estimate parameter (heading) of a GNSS + INS system. The figure below shows how ALIGN helps in very low dynamic situations. This dataset came from a test situation that is very difficult for a lower grade IMU. The error was estimated relative to a navigation–grade, post-processed inertial reference. 2Including ALIGN in an RTK Narrow Integer, verified solution. Why do my ALIGN and INS headings differ? In the INSPVA and INSATT logs, the heading is always the heading from the INS. The HEADING log provides the ALIGN heading between the two antennas. 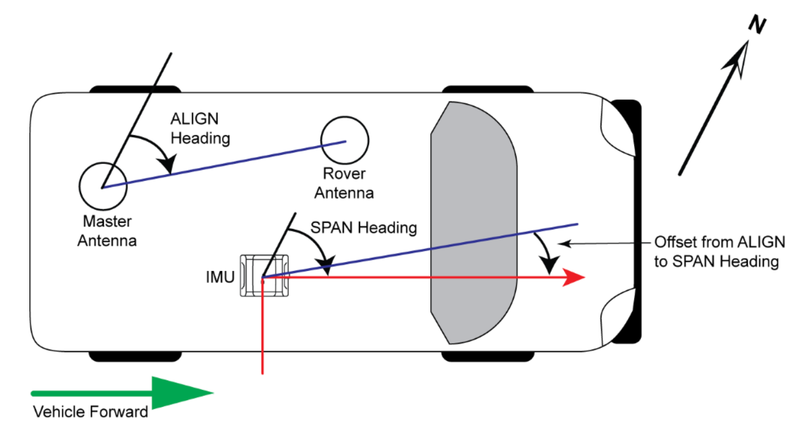 These headings are different because the ALIGN heading is between the two antennas, while the INS heading is determined from the results of the IMU input into the SPAN system. Because these two headings come from different sources, they behave differently. The INS heading will be smoother from epoch to epoch, but will likely wander more in low dynamic situations where the error sources are hard to estimate. The heading derived from the ALIGN system will not wander, but will have sharper, discrete jumps as new measurements are made. Be sure to use the covariance information, available in the INSCOV or INSATTX logs to assess the quality of the solution. What benefit can I expect to see with different IMUs? While ALIGN benefits all SPAN systems; the effect of that benefit is most noticeable with lower grade IMUs, such as the SPAN-CPT. The ALIGN solution helps to restrict the drift that the inertial solution will experience (especially when the system has not had a significant amount of convergence time following coarse alignment). Remember that more turns and velocity changes provide a better chance for the system to improve its accuracy.